The site on which the Old Police Station in Spanish Town is located was originally the site of a Jewish Synagogue. According to Delevante and Alberga, a synagogue, Kahal Kodosh Yisroel, or Holy Congregation, Hope of Israel, was built in 1796 on Young Street. This congregation, founded in 1790, comprised the English and German Jews. From about 1860, the building was in a state of disrepair. 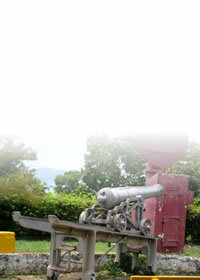 It was pulled down in 1895 and the property subsequently sold. 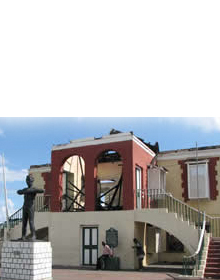 The date of construction of the Spanish Town Police Station has not been definitively established, but based on the architecture at the site; it is quite likely that the Spanish Town Police were stationed at the Wellington Street not long after the Jewish Synagogue was destroyed. Wellington Street continued to be the home of the Spanish Town Constabulary until around 1979 when a new police station was erected on Burke Road. 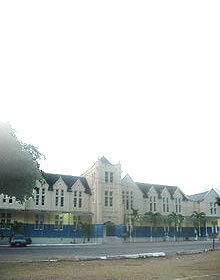 After the historic Court House in Emancipation Square was gutted by fire on March 18, 1986, the site of the Old Police Station was refurbished and used for the sittings of the Circuit and Resident Magistrate’s Courts, and for Petty Sessions. During this time, the special constables attached to the Spanish Town Police continued to operate out of the old police station. The Court House eventually found a new home in 1997 when a new edifice was erected on White Church Street and was officially opened by the then Prime Minister P. J. Patterson in November 1997 ; nevertheless Juvenile Court and Night Court continued to be held at the Old Police Station until 2006, when the building was destroyed in an all-out riot in Spanish Town. Although in ruinate, the visible evidence of the architecture of the buildings on site shows that they are a good representation of the ‘creolization’ of the strict Georgian style with the addition of verandahs providing shading and overflow space.